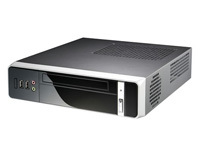 Versatile case with 200W power supply suitable for most Mini-ITX motherboards - Universal 110-240V operation. Identical specification to 8K01, with different front panel design. Power supply: Internal 200W Universal 110/240V ATX Power Supply. Internal 12V P4 and 20pin ATX power connectors included, with 2x Molex, 1x SATA, 1x Floppy power connectors. Not supported: Socket AM2 boards with standard heatsinks, boards requiring over 200W power.